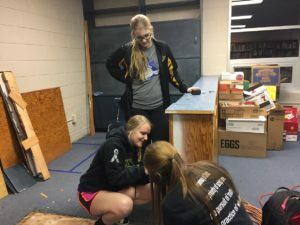 Students at this NW Kansas High School wanted their library back. They formed a committee, started fund raising and performed a lot of the labor themselves. With help from a grant from the Dane Hansen Foundation, a wall was built to create a new library space, ordered technology, furnishings and books. The students performed much of the labor themselves. In addition, they wanted a unique way to get students into the library to see what was available. So, a part of project included establishing a coffee shop serving drinks and snacks before school. The committee trained the presidents of each student organization to run the coffee bar, and each week a different organization works from 7:30 to 8:10. The organizations receive 60% of money coming in during their week, and the library committee gets 40% to maintain supplies. Students are using the new library. Art projects are on display and classroom teachers bring in students to use the flat screen for presentations. Old volumes were weeded out and sold and there is now a great selection of current books available. Nine volunteer community members come to the high school and serve as the librarian one day a week from 10:00 a.m. until 2:00 p.m.